The Maker Ed team is excited to announce that we have just moved to a new location in the West Berkeley corridor, long known for its arts and manufacturing industries! Our new Maker Ed Community Studio will serve as a destination maker-centered training center and event space, a place where we can continue to test and iterate on our learning, deepen our own practice, train and convene educators, and build a validated, professional field for maker education together. The beautiful Victorian building includes multiple office and meeting rooms, a full kitchen, and an adventure playground, garden beds, and woodshop area outside. But the most exciting feature of the space, for us, is the 1,200 sq. foot, ADA-accessible studio on the ground floor, which we are converting into a fully-functional makerspace! The Community Studio is open for community use as an event space, and/or a tinkering and prototyping location for other maker education practitioners, as well as open for use for workshops, events, and camps. 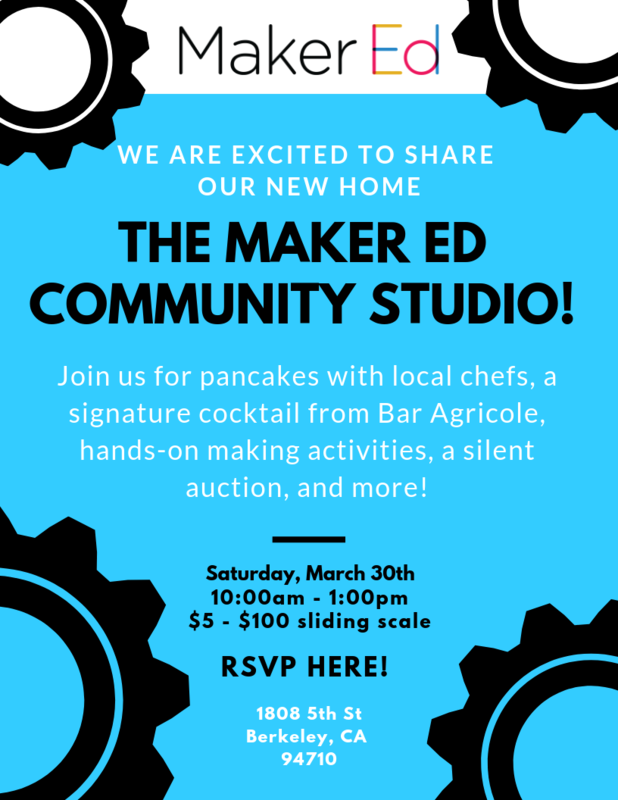 We hope this space will come to embody the ethos of our work: equitable, community-driven, accessible to a wide variety of makers, and filled with joyful teaching and learning. We’re very excited to invite you to come see us in our new home, and hope you’ll join us!